Joseph (Shakespeare in Love) Fiennes stars as Martin Luther in LUTHER, a tumultuous historical drama about the man who took on popes, emperors, princes and a big chunk of humanity in his fight to reform and revitalize Christianity. 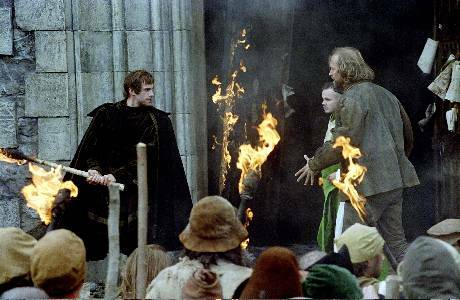 Rooted in the 16th century, shot on over 100 sets in twenty locations throughout Germany, Italy and the Czech Republic, LUTHER was directed by Eric Till and shot by Robert (Seven Years in Tibet) Fraisse and features an all-star supporting cast which includes Peter Ustinov, Alfred Molina and Claire Cox. #65A-134-7 From left to right: Joseph Fiennes (as Martin Luther), Marco Hofschneider (as Ulrich) and Jochen Horst (as Carlstadt) in Eric Til´s "Luther". Camille Thomasson and Bart Gavigan's script introduces Luther as a young budding lawyer whose almost neurotic love of Christ motivates him to become a monk. Rebel and firebrand that he is, Luther is forced into a confrontation with the church when Pope Leo X begins selling indulgences to finance the construction of St. Peter's Basilica in Rome. Luther's battle against religious corruption, hypocrisy and dogma almost costs him his life, but he doesn't falter in his quest to change the world. Fiennes portrays Luther with flair and finesse, and the movie dramatizes complex social and theological issues in a bold and vibrant way, making what could have been a dry history lesson entertaining and engrossing. The film fails, however, to address Luther's vicious and pathological anti-semitism.